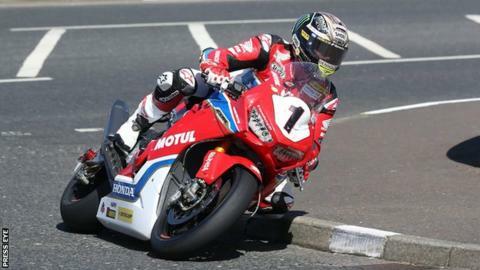 Six-time North West 200 race winner John McGuinness could miss this year's event due to the oversized engine on his Norton SG8 superbike. Competition rules state that machines in the Superbikes class cannot have an engine capacity of over 1000cc. The bike that McGuinness, who intends to return having missed the 2018 event, was set to race has a 1200cc engine. The same issue has also put the Englishman's participation in this year's Isle of Man TT in doubt. McGuinness has 23 wins at the Isle of Man event, a win tally that puts him second in the all-time TT list behind Joey Dunlop. In 2017 he sustained a leg fracture and broke four vertebrae and three ribs in a crash at the North West, but returned to the sport at the Festival of Motorcycling last year. His expected comeback to the famous Triangle Circuit has been highly anticipated and race organisers have expressed that they hope to have the situation resolved in time for this year's event in May. Event Director Mervyn Whyte MBE said that the initial entry, received in February, stated that McGuinness would compete for the Norton team on a machine with an engine capacity of 1000cc. "The organisers were subsequently informed on 26 March by Norton that the engine capacity of the SG8 superbike they intend to race at the North West will be 1200cc," Whyte continued. "It does not, therefore, meet the current Technical regulations for the NW200 superbike races and would not be eligible for competition at the event. "John McGuinness and Norton CEO, Stuart Garner, have both been informed of that situation. "It is hoped that a solution can still be found to resolve this issue before May and that both John McGuinness and Norton will take part in the 90th anniversary event."